A Maternity Nurse Company candidate recently suggested to us that this would be a great topic for our blog. When we asked why, she said, “New parents do so much work to get ready for their new baby, but sometimes they forget the simple things that would really improve their first few weeks with a baby.” Intrigued, we asked what she meant and her answer was so illuminating we thought we’d devote a whole blog post to it. Screen doors are unusual in the UK. But they can be found, stable doors are slightly more common. Both offer the opportunity to check up on baby without having to open and close the door. Both keep other children and pets out of the nursery too. Tiny environmental changes can be a major trigger to wake up in newborns. 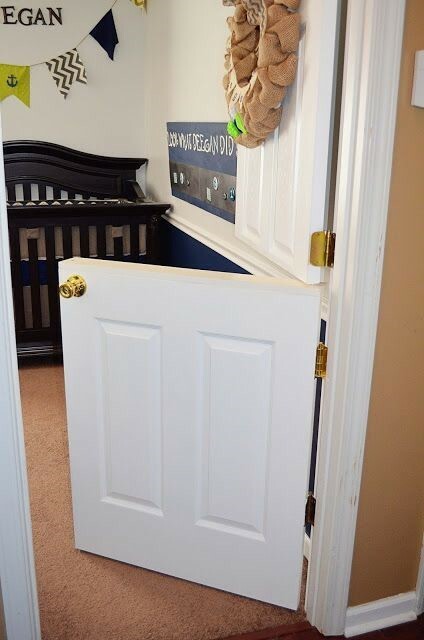 So the simple act of opening and closing a door can cause exactly what you were trying to avoid, a disturbed newborn! Whether it’s a night maternity nurse, a freezer full of casserole meals. Or an experienced dog walker to take care of your pet. Knowing what help you need can be a way of ensuring that everything from the first contraction, to the birth, to baby’s first visitors runs smoothly for the entire household. It shouldn’t need to be said, but sometimes new parents lose sight of the pleasure. List-making, ticking things off, resolving difficulties and addressing problems become all that they can see. But having a baby should be an amazing, joyous, rewarding experience. It’s important to focus on this part of the journey every single day.